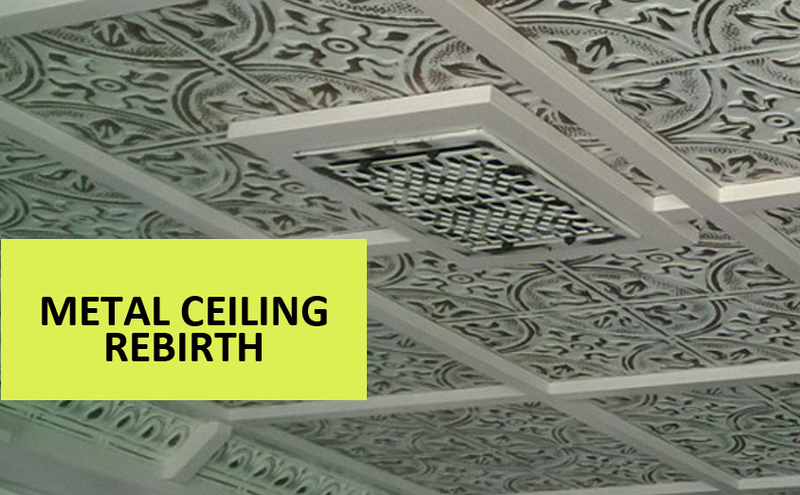 The use of tin ceilings developed around the mid-nineteenth century. It was also a time in which tin was mass-produced as sheets of thin, plated steel. People were looking for a more sophisticated design option, and this was an affordable way for them to go. They were also an easy to install choice, which made them even more sought after around the turn of the century. Even if you had a smaller space to work with, you could find something suitable to fit the space, or you could choose a grander looking design for larger spaces. Back then, decorative metal ceilings could be seen more often in commercial applications rather than residential. It was commonly used on walls, in stairwells, and on the ceiling. Metal ceilings have since begun declaring their popularity again as a go-to design choice that is relatively inexpensive but also allows for a wide range of design and style options for any room in the home. They are also a popular choice due to the aesthetic they offer the space. They are available in a range of styles including steel, copper, brass, chrome, and even aluminum and they have just as many finishes to choose from as well including a bare finish, polished, or powder coated. Metal ceiling tiles can also be painted so they can match any of the already existing décor which makes them a very attractive choice for aesthetic purposes. In addition to the great aesthetic that metal ceilings have to offer a space, there are also several practical benefits one can experience with this material. Metal ceiling tiles require very little maintenance once they are installed. The only thing you will really have to do to make sure they look their best is to dust them or wipe them down occasionally with a damp cloth. They are also fire-resistant because they are made of metal, which makes them a much safer option to choose for residential or commercial use. Metal ceiling tiles can also hide any imperfections that may exist such as holes or damage on plaster ceilings that would otherwise need to be repaired. This also makes metal ceiling tiles the ideal choice for those looking for a home refresher or renovation project. The materials used to make the ceiling tiles are much lighter than a plaster ceiling, which also makes them much easier to install. The entire installation process from start to finish is also considerably shorter. Metal ceilings are also very durable and strong and are built to last. Typically, they can last up to two decades until it gets to the point of perhaps paint beginning to flake off or lost luster. However, metal ceilings will not decay over time and are built to last. Did you know that metal is a conductor or both heat and cold and is not an insulator? Metal ceiling tiles conduct temperatures, so if you have proper insulation on the outside of your home or business, then these tiles will definitely benefit you. Finally, metal ceiling tiles are a very versatile design choice that can be used in any room around your home or business. The tiles do not have to be placed on the ceiling. They can be used on walls, in stairwells, or even just as decorative pieces in a space to serve as a focal point. Metal ceiling tiles can also make a smaller space appear much larger and are great if you find that you have an old and outdated popcorn ceiling that you want to cover. Metal ceilings will remain a popular design choice because this style takes us back to a time when everything that was made was built with much care and fine attention to detail. It offers us a touch of elegance and luxury for our homes without the high price tag and high level of care and maintenance that is typically required of other materials.